More than 78,263,269 beer lovers served! Hours: Wednesday-Friday 3:00pm-9:00pm, Saturday-Sunday 1:00pm-9:00pm. I'm told that they produce "house brands" for some Bay Area restaurants, but I don't have any specifics. 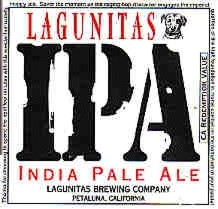 A big mahalo to Lagunitas' own Sean Silvera and Steve the Anonymous Coordinator Guy for sending most of the bottled beers I've reviewed here. The labels alone are worth the price of the bottle...the excellent beers are a bonus! 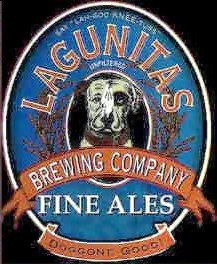 We at the Lagunitas Brewing Company believe in the three Great Principles of Craft Brewing. 1) Always be true to your school. 2) Never use the word Autolysis in public. 3) Be obsequious, and live in a swamp. Floral, fruity — peaches and pears and citrus. Medium body, really fizzy. Sweet malt and fruity hops, very mildly bitter. Very "Belgian Pale Ale"-y. The label is eminently nonsensical. Intense brown sugar. Spicy, fruity hops. Thick and sweet and smooth and malty, with a nice alcohol burn. Mild fruity hop flavor in the finish. Pretty black, red around the edges, good head. Coffee nose, with hops. Thick and roasty. Roasty bitterish finish. "Contains no known actual insects...add to taste." Black, thick nitro-tap head. Oooooo...great coffee nose. Sweet, coffee flavors. Coffee all the way through the finish. Rich copper color. Moderate head. Fruity hops, lots of caramel, some alcohol. Big creamy body. Rich caramel malt flavor all the way through, with a nice fruity hop flavor and bitterness in the finish. Pale amber, good carbonation, OK head. Aroma has a good caramel/hop mix...could be stronger. Real good body. Smoky-hoppy flavor. Smooth bitter finish. High carbonation bite. "No dogs were harmed during the Dog Town Pale Ale brewing process." Deep dark red. Nice thick head. Huge caramel-malty, spicy-hoppy aroma. Big smooth body. Lots and lots of dark caramel maltiness. Lots and lots of spicy hop flavor and bitterness. Nice alcohol bite that seems to get stronger after the lingering finish. This beer does an excellent job of washing down chocolates. Big body, fizzy. Mild caramel malt and big fruity hops. Fairly bitter. Deep dark red. Massive dense head. Big creamy smooth body. Hint of licorice up front, phenomenally roasty, with a big tasty maltiness. Not a lot of alcohol flavor nor warming sensation, which makes this a dangerously subtle and tasty beer. Deep amber, slight haze. High carbonation makes a thick head. Intensely fruity and citrusy with loads of caramel. Big body, rather fizzy. Massively malty, with a biscuity flavor. Pretty bitter, with a big green hop flavor. Mildly resiny hoppy finish, with lots of grapefruit. Golden amber, quite a bit of haze, massive head. Floral-fruity hop aroma. Medium body, plenty bitter. Nice carbonation bite, nice balance. This is a Real Smooth Beer. A little resiny hop feel at the very end. Quoting the label: "Thanks for choosing to spend the next few minutes with this special homicidally hoppy ale. Savor the moment as the raging hop character engages the imperial qualities of the Malt foundation in mortal combat on the battlefield of your palate!" Thanks to Chuck Farnham for the bottle. Golden-amber, good carbonation and head. Very nice hop aroma, some smoke. Good body, fairly bitter. Smooth bitter finish. Good hop flavor. 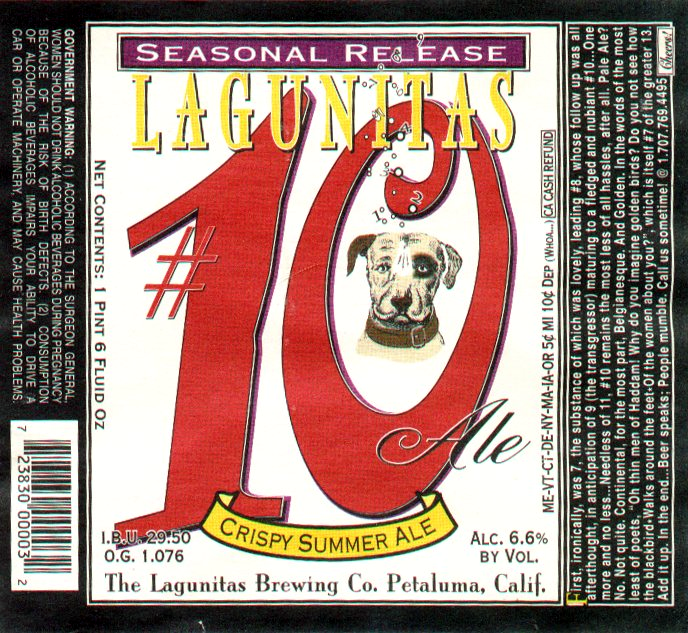 "100th batch since January 1994...1.059, 45.6 IBU"
Dark red opaque, nce brown head. Lots of caramel aroma, some hops. Big beer, fairly bitter, good crystal flavor. Long bitter finish. Yellow. Slight haze. Thick head. Medium body, fizzy. Sweet and citrusy, with a medium-big bitterness. Clean hoppy finish. Red. Some haze. Thick head. Huge spicy hops, citrus. Lots of caramel malt. Some alcohol. Great big body, moderate carbonation. Lots of caramel malt and lots of spicy, earthy, fruity, bitter hops. Clean hoppy finish with a hint of alcohol. Hazy amber. Big thick head. Fruity, spicy hops — lots of 'em. Big smooth body. Huge spicy fruity hop flavor, nicely bitter. Excellent clean malty base. Golden-amber, high carbonation, OK head. Nice hop nose. Thick, malty, just bitter enough at first...finishes sweet. 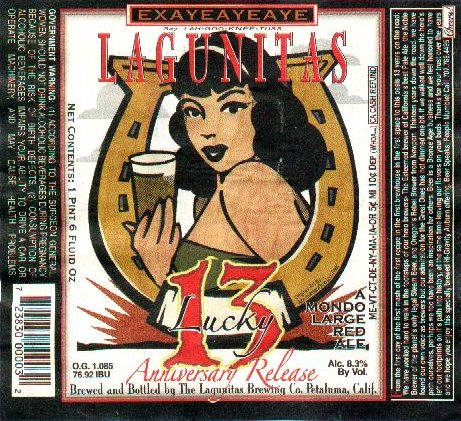 According to the label, "Originally we were going to name this categorically ambiguous ale an 'Oat Brewed-Cold Filtered-Ice Draft-Super Premium-Wormwood Aged-Cold Fermented-Pale Bock Style-California Brewed-Mother Lovin'-Yada-yada-yada-Ding Dong Dang-Beer'. But, alas, we learned at the last minute that due to an arcane state law we are actually unable to call it beer at all. We believe that Kafka himself would have been impressed." Sweet, bready. Mild fruity hops. Medium body, fizzy. Flash of grassy bitterness up front, followed by sweet grainy malt. Bitterness returns in the finish. Clean red, very low carbonation. Good white head. Starts fruity. Excellent body and caramel flavors. Great brown ale character. Clean. Very nice indeed! Very very mild chocolate. Very very mild roast. Medium-big body, fairly fizzy. Big grassy hop flavor, medium bitterness. Chocolate, nicely roasty. More malt sweetness in the finish. Warming at the end. They call it a "high-gravity cream ale". It's bright deep golden, with some tiny floaters and a thick head. Malty, smoky aroma with big grassy hops. 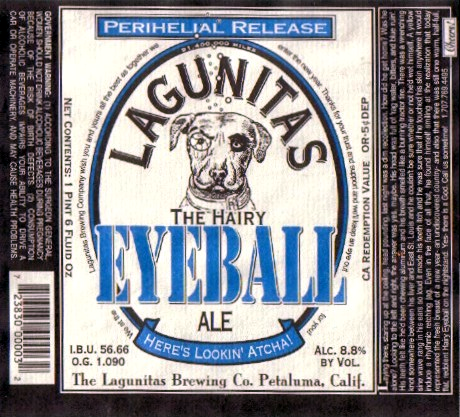 Huge body, massively malty, with a big earthy/grassy hop flavor. Lingering warming bitter finish. Big spicy, piney hops. Mildly toasty. Medium body, smooth. 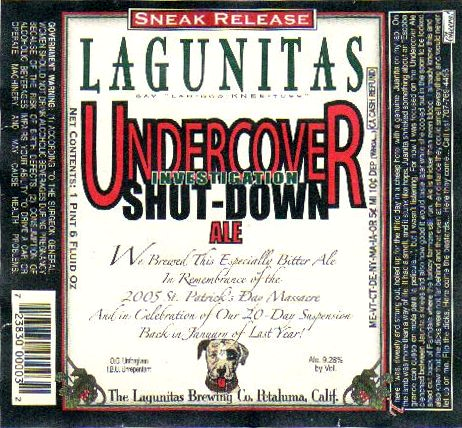 Rich biscuity malt underlies a medium-big spicy, resiny hop flavor. Medium-big bitterness. Real clean. Great beer, but I don't get the hype. 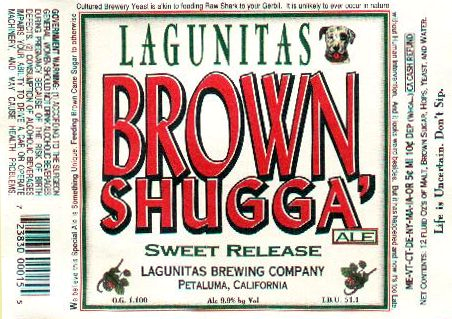 Originally brewed as a replacement for Brown Shugga'. Bright amber-brown. Huge creamy head. Spicy, fruity hops, mild citrus. Big toasty, caramel malt. Big body, real smooth. Hugely malty with a big resiny, piney, grassy, spicy bitterness. Warming. Damn fine beer. Bottle conditioned. Yellow opaque, good carbonation and head. Yeasty-fruity aroma. Good body, good wheat flavor. Well-balanced. Carbonation is a little high. Finishes clean, except for a small yeast bite. Good beer. Spicy, toasty. Floral, brown sugar. Chewy, fizzy. Sweet and spicy and floral and bitter. Citrusy and resiny.